High quality precision No. 2 cut files. Made from high carbon steel that’s been hardened and tempered and applied with a sand blasted finish. The two-tone soft-grip handles provide users with extra grip, perfect for delicate work, fine abrasion, profile cutting and finishing many workshop materials. Overall length 140 mm. Conveniently stored in plastic storage wallet, these files are essential for delicate and intricate filing. 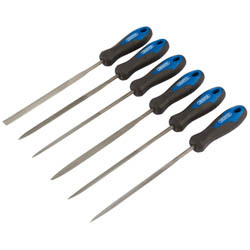 flat parallel, flat taper, half round, three square, square and round files.